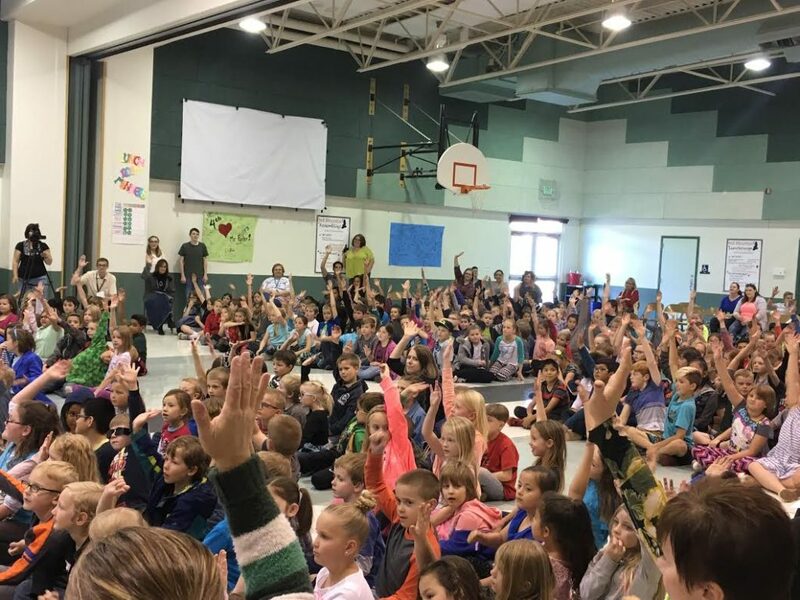 IVINS — The lunchroom/gymnasium at Red Mountain Elementary in Ivins was decorated with posters and balloons and filled with the excited energy of children Tuesday afternoon for a surprise assembly honoring Jay Porter, the school’s assistant principal. Porter was recognized as a top five finalist for the LifeChanger of the Year award given by National Life Group. The LifeChanger of the Year award is a national award open to educators, administrators and school district employees for grades kindergarten-12 in all 50 states and the District of Columbia. 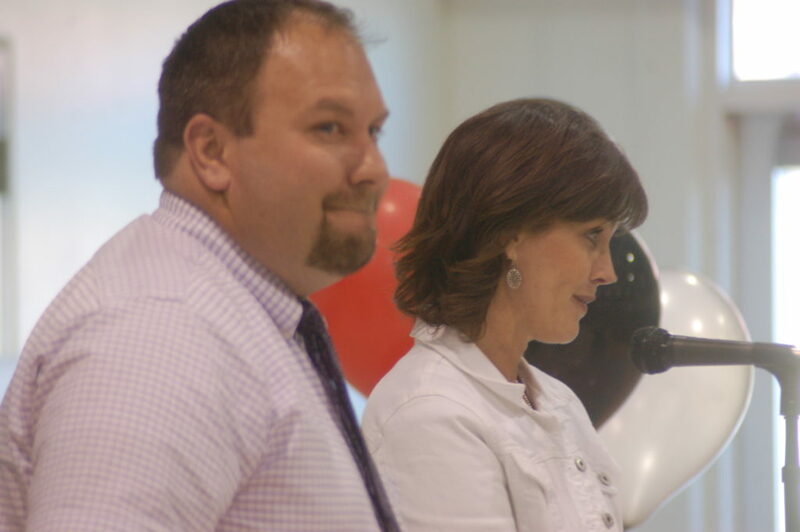 Over 720 teachers and administrators were nominated for the award including Porter who was nominated by Red Mountain Elementary Principal Amy Mitchell in the summer of 2016 , Mitchell said. As a finalist, Porter received $2,500 for himself and $2,500 for his school and is eligible to attend the national conference in Naples, Florida, held in April where they will announce the LifeChanger of the Year final winner, Matt Josten, a senior relationship manager for National Life Group, said. To pull off the surprise, Porter was asked to substitute a class for a teacher who had a scheduled dental appointment but in reality he was sent to the class so that the school could honor him at the assembly. Porter arrived at the ceremony to the cheers and high-fives of the students whose lives he impacts on a daily basis. It was an honor that was well-deserved, Mitchell said. As assistant principal, Porter is the Title 1 coordinator for the school and takes care of the needs of the children who qualify for free and reduced school lunch, many of whom have been identified as a more at-risk group of students. Approximately 72 percent of the student population at Red Mountain Elementary fall in the low-income bracket that qualify them for free or reduced lunch, Porter said. In addition to handling the grant funds and watching over those students, Porter also coordinates many of the parent outreach and discipline programs in place at the school, he said. Porter has helped institute a watchdog program which brings fathers and father figures into the school to act as safeguards and friends for the students. He has also coordinated counseling for families and has brought in the School of Life Foundation which teaches positive attributes that the students can achieve, Mitchell said naming a few of the impactful things Porter has done for the school. Josten said that Porter was chosen as a finalist for going above and beyond the normal job and rising to another level. Josten said that it was evident at the assembly that the students love Porter. “They absolutely adore this gentleman,” Josten said. Porter took his award in stride, thanking all the amazing teachers who spend every day in the classroom with the students and pausing to either hug or high-five each child as they left the assembly. Porter said he’s devoted his life to education and to helping the disadvantaged students climb obstacles and soar in the future. Porter hopes to attend the Florida award ceremony and take his wife as his date, he said.